Here you'll find a relaxed, friendly environment where riders of all levels come together to improve their skills and enjoy each other's company. Whether you're an avid hunter-jumper competitor or new to English riding, you'll feel right at home. Trainer Sommer Anthony offers private and group lessons to children and adults. Our beautiful facility offers airy, comfortable stalls and large, grassy turnouts. 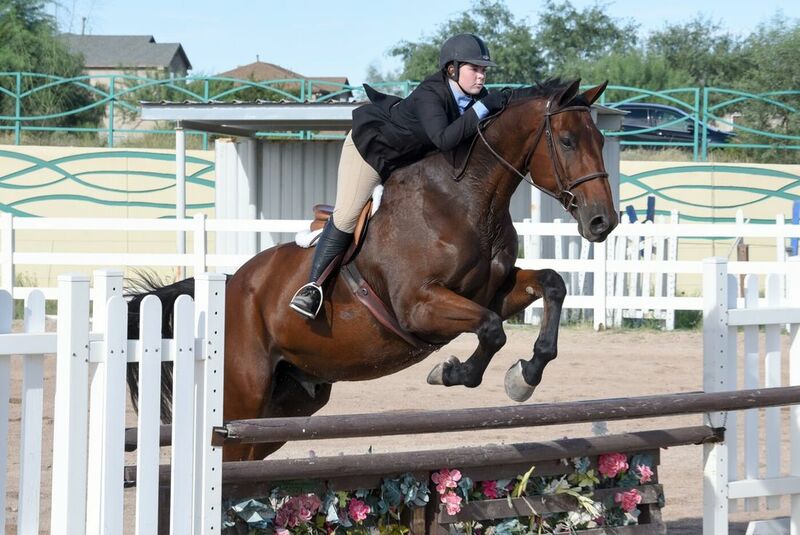 We are Tucson's only Interscholastic Equestrian Association hunt seat team. Safety: Helmets and boots are required, and everyone follows strict safety practices while grooming, riding and doing chores. Good horsemanship: Students learn sound basics right from the start and are expected to treat the horses, equipment, property, and each other with respect. Support: We bring riders along at their own pace, respecting their individual needs and desires. We are here to share our love and expertise in English riding with those who want to learn and grow, letting their agenda be ours. Please contact us to arrange a tour and discuss your interests in hunter jumper training, riding lessons or boarding!